I’m sure you’ll agree that the right set of dog clippers must have enough power to cut through thick fur. That was our top criteria for selecting the best dog clippers. 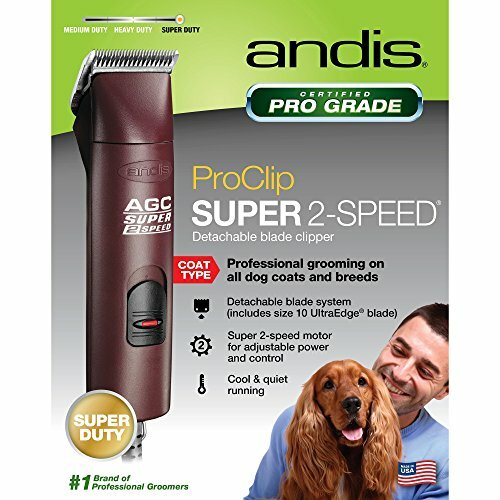 If you want to cut to the chase the Andis UltraEddge clippers are this year’s winner. These top-rated dog clippers are customer favorites because they are durable, easy to learn to use, and produce great results that can accommodate the average pet owner up to the professional dog groomer. If you have a dog that requires regular trimming, you have the choice of taking them to the groomer every few weeks or learning how to do it yourself which will save you time and money. Plus they won’t be scratching the wall around your dog gates as much with nicely trimmed nails. If these top-rated dog clippers are not quite what you’re looking for, we’ve provided a buyer’s guide that will give you additional information on various brands and styles of dog clippers. This buyer’s guide will help you identify what makes one set of dog clippers better than another. This clipper combines power and a compact size into one great product for a professional trim regardless of whether you need to give a quick touch up or a full trim. With 2 speeds for your convenience, and a 4×4 blade that offers 25% more blade torque that other clippers, this could be the last dog clipper set you ever need to buy. You won’t have to worry about it overheating or hurting your dog thanks to the cool running motor. Its quiet operation works great for sensitive dogs that get scared around the wirling noise of the blades. Cleaning is simple with the removable drive cap and you won’t need to do maintenance of any kind including oiling or greasing the parts. The ergonomic housing is also a customer favorite as it is comfortable, break resistant, and has a sealed motor so no chemicals can get in and damage the motor. Because of its comfortable grip, groomers can use these clippers for long periods of time with ease. 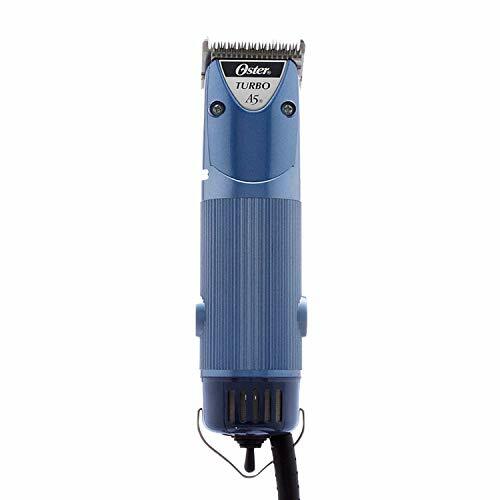 If you are looking for a great, professional-grade clipper, this may be just what you want. The Oster A5 Turbo has a 2-speed universal rotary motor that is conveniently compatible with all Oster CryogenX detachable blades. Another benefit to these clippers is that they run cooler so you don’t have to worry about them getting too hot to handle, even with extended use. These are the perfect clippers for both regular pet owners and professional groomers. You will need to use oil and grease to maintain these clippers but the included instructions makes it an easy job. With the detachable blade system you get a lot of versatility making it quick and easy to change blades. You have several fun color choices available with these clippers. These include: ice blue, aqua blue and muddy girl (these are limited edition colors) operation home front, velvet blue, and zebra print. At 120v and 4000 strokes per minute, these dog clippers are the perfect choice. Wahl is a very popular name when it comes to beard trimmers and regular clippers but the brand also carries a fantastic, professional, cordless pet clipper kit. These excellent, professional-grade clippers will not get overheated and they will not need coolants. They simply don’t get hot. You will also have the added benefit of a second NiMH battery so you can charge one while using the other. These are great for long jobs or if you have more than one dog to clip. Each battery gives you up to 80 minutes of run time on a full charge. It is the perfect clipper kit for all breeds of dogs and can be used for finish work as well as on the face and feet. It is a perfect choice for the professional groomer. These Wahl Arco clippers are lightweight and quiet too so your dog clients will not get spooked while you’re trimming them. The 5-in-1 blade system makes changing blades as simple as flipping a switch. No separate blades to worry about keeping track of. They snap off effortlessle so that you can easily clean them, and they snap right back on. These clippers come with a 1-year professional warranty. You have several beautiful colors to choose from including champagne, chrome, pink, purple and teal. These top-rated dog clippers are the perfect tool for any dog groomer who wants to do an excellent job and work with exceptional tools. Whether it’s your regular career, one you’re just starting, or you’re a dog breeder wanting your dogs to look as good as possible, these top-rated dog clippers will be just right. The professional-grade quality of all three of these top rated clippers will please even the busiest of professional groomers. The great thing about them is that you don’t have to be a professional to use them. You can just be a dog owner that wants to keep their dog in excellent condition. In addition to the above three, top-rated dog clippers, we’ve provided a detailed buyer’s guide below that offers great information and in-depth statistics on dog clippers. We’ll tell you what to look for and how to choose a great set of clippers versus a style that will leave you feeling frustrated. Dog clippers are specifically designed clippers that are used by pet owners, breeders and groomers to keep a dog’s coat trimmed and neat. There are several different styles on the market, so knowing what makes a good set of clippers can mean the difference between easily trimming your dog’s coat and struggling to get the look you want. Trimming your dog’s feet or occasionally trimming stray hairs – This is the lightest use of dog clippers. If this is all you need, you will only need an inexpensive set of clippers. It is not necessary to spend a lot of money on clippers for this light use. Maintaining a good show coat or pet coat – You may want to keep your dog’s coat trimmed between professional grooming sessions. If this sounds like the situation you’re in, you can choose a mid-range set of clippers that have a variety of blades to accommodate the breed of dog you will be trimming. These mid-range clippers also come with a mid-range price tag. They won’t be the most inexpensive set you find, but they won’t be too costly either. Trimming and Styling Your Dog’s Coat – If you are looking for a set of clippers that will enable you to trim and style your dog’s coat on your own, you will want to opt for a professional-quality set. These will have a higher price tag but the quality far surpasses the price. Also, you won’t have to replace them unless something goes wrong. Most of the professional-grade clippers have more than one speed and several blade styles to choose from. In addition, they may also be cordless which is great for added mobility. These are also good for professional groomers, whether established or just starting out. The type of coat your dog has will determine what kind of clippers you need. There are good clippers for every type of coat. Thin coats – If you have a dog with a thin coat, you won’t need a heavy duty set of clippers for grooming. A set of electromagnetic motor clippers will work great. They are low maintenance and also low cost which works well for a dog that doesn’t need to be groomed very often. Thin to Medium Coats – This type of coat requires more grooming than a thin coat so the best clippers to get for a medium coat is pivot motor clippers. They also have an electromagnetic motor but it’s configured in such a way that you have more power than you would have with a standard electric set of clippers. Heavy Coats – For this type of coat you want to look for a good set of rotary motor dog clippers. This will give you all the power you need to cut through thick fur. Professional grade dog clippers typically have a rotary motor and also have a blade attachment that allows the pet owner or groomer to change blades quickly while grooming the dog or for grooming different breeds of dog on a regular basis. Dog clippers can easily be a grooming tool that is overlooked unless you are a professional groomer. For groomers, they are the mainstay of the grooming kit. What pet owners may not know is that having a good set of dog clippers can help take care of their dog’s coat and they will look great all the time. They will also have healthier coats due to the care and attention. There are several standard features that you want to look for when you are shopping for a good, reliable set of dog clippers. Here are a few things that will make using the clippers much easier and more efficient. Maintenance Free – Having to take apart your dog clippers to oil or grease them can be messy and frustrating. There are many great models on the market today that are maintenance free and don’t require oiling or greasing of any kind. This doesn’t mean they don’t need to be cleaned, it just means they don’t need to be oiled or greased. Cool Running – You want to look for dog clippers that don’t require fans and air vents to stay cool. These vents and fans can become clogged and mess up your dog clippers and they can also get hot to the touch while using them. Cool-running dog clippers won’t do this which makes them perfect for longer jobs and groomers. Ergonomic Design – When a product has an ergonomic design it means that it has been designed in a way that is comfortable for the user to hold, even for extended periods of time. This is perfect for groomers since they could very easily be holding a set of dog clippers for much of their day. Rust and Chemical Resistant blades that are detachable – You definitely want to look for this feature on the clippers you purchase. When you purchase a set of clippers that has rust-resistant and chemical-resistant blades, the clipper set will last longer and you won’t run the risk of cutting the dog with rusty blades. Having detachable blades makes it fast and easy to change blades which is great when you are trimming different breeds of dogs. Break Resistant Housing – No one plans on dropping their dog clippers but it does happen. Having a break-resistant housing can ensure that if you DO accidentally drop them, they won’t break. Multiple Speeds – If you’re going to be doing any kind of medium to heavy grooming you want to have a set of clippers that has at least 2 speeds to work with. This enables the user to have some flexibility. Quiet Operation – Some dogs are very sensitive to noise and dog clippers can really scare them. It is a good idea to look for dog clippers that operate as quietly as possible for dogs that are sensitive to noise or who are just generally fearful. Finish cut blades – Once the bathing is done, finishing blades are used to finish your dog’s trim. This is great for a dog that has a fast-growing coat. The finishing blades will do exactly what their name implies…they will give the dog that finished look. Skip tooth blades- If you’re grooming or trimming a dog that has dense fur or fur that has become matted, a skip tooth blade can cut through it easily. Use skip tooth blades before giving the dog their bath because dealing with wet mattes can be very frustrating. Wet matting can also pull the dog’s fur and skin causing discomfort and fear in the dog. Wide blades (T blades) – These blades are best suited for clipping larger dog breeds because they are larger blades. The clippers are usually larger as well. The good thing about wide clipper blades is that you will take off more hair with each sweep of the clipper. When you are clipping a large dog, this is very beneficial or you may feel like you are clipping the large dog for days. Before you use your dog clippers for the first time be sure that you read the operating instructions and also the safety instructions. You want to become familiar with the dog clippers before you use them on your dog for the first time. Practice holding the dog clippers to make sure you find the best grip for you while you are grooming your dog. Get him/her use to the sound of the clippers so they don’t try to escape when they hear them turn on for the first time. Before you get started with your dog clippers be sure to bathe your dog and remove the tangles and mats they have from their coats. This ensures that the clippers will not grab and pull your dog’s fur. You don’t want to clip them before they’re dry so put them under a dog dryer or use a blow dryer – as long as it doesn’t scare them. Using dog clippers properly, and finding the right ones for your needs, is important to make sure your dog gets the best clip possible. Having the right dog clippers is a crucial part of making sure your dog looks great. The information in this buyer’s guide details what features to look for and what types of blades you can use. It also includes additional, valuable information that can help you choose the right set of clippers and get the most for your money.